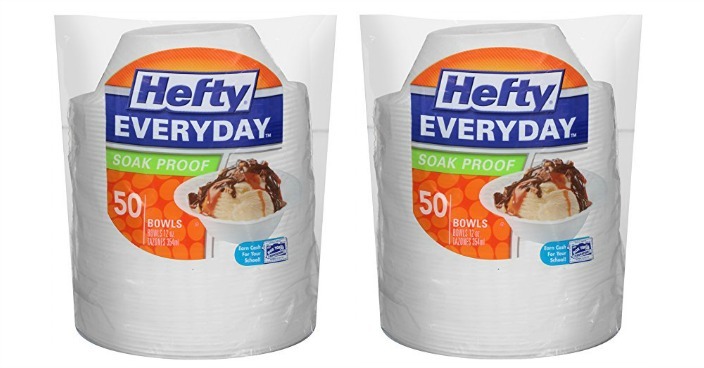 Hefty Everyday Foam Bowls Just $1.69! You are here: Home / Great Deals / Hefty Everyday Foam Bowls Just $1.69! Amazon has these Hefty Everyday Foam Bowls on sale for $2.30 but you can pick them up for only $1.69 when you choose Subscribe & Save! Plus you can get FREE shipping on orders over $49 or if you are an Amazon Prime Member and these plates are an Add-on so you must check out with at least $25 in your cart. Hefty Everyday Foam Plates and Bowls are soak-proof so they prevent messes and leaks and make clean-up easy. Use them to serve your favorite party or snack foods, as part of everyday dinners, or in arts and crafts projects.